Our cancellation policies are very simple and can be seen all the time,even during the time of your booking . When you reserve your seat for a particular bus/operator, the cancellation policy is displayed on the right hand side of the bus layout for immediate reference and understanding. The cancellation policy is also clearly mentioned in the booking confirmation email and booking attachment that is received along with the confirmation email. Even at the time of clarification wrt cancellations, please use Call Free, Live Chat or Toll Free support options for immediate response from our Customer Care team. No need to dig our site to know cancellation policy for particular bus, simply passengers are able to check out cancellation policy at the time of bus ticket booking in seat layout. 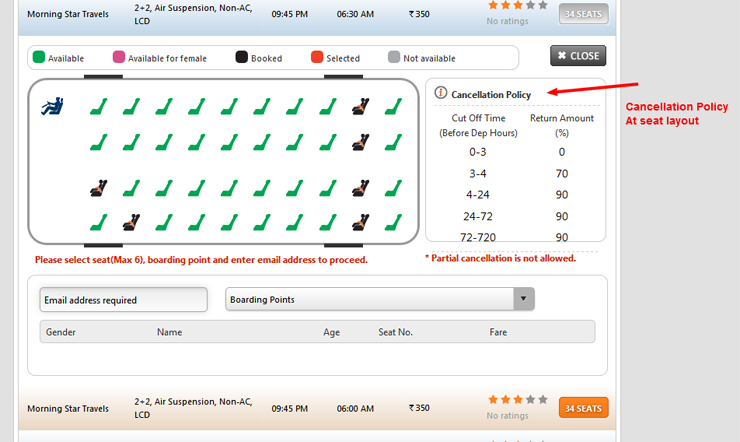 Even passengers can view detailed cancellation policy at the time of ticket cancellation.